Harken recommends equipping every system with Carbo lead blocks for safe furling from the cockpit. The 7404 kit’s lightweight, UV-stabilized Carbo blocks run exclusively on ball bearings for fast trimming under any load. A 7402 ratchet maintains tension when spooling so the unit furls smoothly and easily. 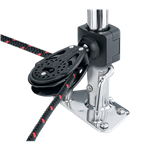 The 7403 outboard assembly allows the furling line to travel outboard of the stanchion to keep the sidedeck clear. Block mounts with a strong four-screw clamp without removing the stanchion or lifelines. Use the 7401 or 7407 block on the bow pulpit as an inboard lead. Use the 7405 as an inboard lead for two lines, for continuous line furlers, or cutter-rigged boats with two furlers. 7401, 7402, 7405, and 7407 have ball-and-socket bases to align blocks for smooth leads aft. The 7404 lead block kit provides a complete system for most boats. The 061 and 7408 bases for Carbo and Classic blocks lead furling line inside the stanchion. A halyard restrainer keeps the halyard against the mast. This provides a better angle to the halyard swivel and prevents it from wrapping around the foil. Stainless steel brackets feature hardcoat-anodized aluminum sheaves that accommodate both wire and rope. A halyard deflector prevents the jib halyard and other halyards (such as a spinnaker or additional jib halyards) from wrapping around the foil. Prefeeders and snap shackles facilitate fast sail changes. The 7006 prefeeder features hardcoat-anodized rollers with low-friction bushings.